The Symphony accommodations at the Town Plaza in Whistler has plentiful comforts and perks - a perfect Whistler lodging option for your next visit! Explore the details for the individual Symphony vacation properties, then simply book directly from the property page for an instantly confirmed Town Plaza Whistler reservation. You pay less & get more personal service by booking direct with a Symphony property owner without paying middle agent fees. Great location. Walking distance to ski lifts, gondola, stores, restaurants and movie theatre. Cosy studio with kitchen, fireplace, cable TV, free internet access. Building has heated pool, hot tub, gym, gated parking. GREAT LOCATION walk to everything. Large one bedroom with 2 bathrooms and private laundry. HIGH SPEED INTERNET INCLUDED! Symphony Whistler Homeowners - List Your Vacation Property! Manage your vacation rental yourself, no matter where you live. Scrap expensive commissions and take control of your Valhalla property in a few minutes per day, no matter what time zone, country, state or province you live in! For a flat annual subscription fee, you learn how to do it and you get powerful online tools, services, business and marketing tips that help you capture more business from all of your marketing methods. Learn more about how to take control of your Symphony Whistler vacation home or contact us to learn more. AlluraDirect.com list vacation rentals in other destinations. We help Owners succeed online through all of their marketing methods. 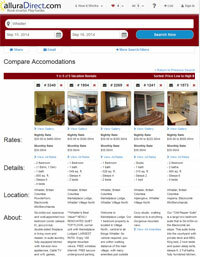 Read about vacation rental service details or contact us for more info.